The 2017 Toulon Tournament (officially French: 45ème Festival International "Espoirs" – Tournoi Maurice Revello) was the 45th edition of the Toulon Tournament. The tournament was named after Maurice Revello, who started the tournament in 1967 and died in 2016. It was held in the region of Provence from 29 May to 10 June 2017. The 2017 edition was the first to feature 12 teams. The tournament was won by the defending champions England, who claimed their sixth title, beating Ivory Coast 5–3 in a penalty shootout after the game ended 1–1. Twelve participating teams were announced on April 12, 2017. The twelve national teams involved in the tournament were required to register a squad of 20 Under-20 players. A total of four cities hosted the tournament. ^ Hélder Martins de Carvalho took an assistant's place during the tournament. Every match consisted of two periods of 40 minutes each. 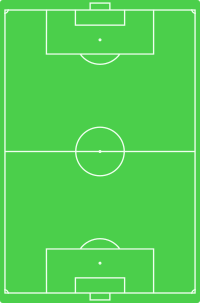 In a match, every team had nine named substitutes and the maximum number of substitutions permitted was four. In the knockout stage, if a game tied at the end of regulation time, extra time would not be played and the penalty shoot-out would be used to determine the winner. The draw was held on 15 April 2017. The twelve teams were drawn into three groups of four. The group winners and the best second-placed team qualified for the semi-finals. The Group stage was played from 29 May to 6 June 2017. The knockout stage was played on 8 and 10 June 2017. 61 goals were scored in 22 matches, for an average of 2.77 goals per match. After the final, the following players were rewarded for their performances during the competition. The best XI team was a squad consisting of the eleven most impressive players at the tournament. ^ "Today, it's been a year since Maurice Revello left us..." 5 February 2017. ^ "Maurice Revello n'est plus…" (in French). 5 February 2016. ^ "OFFICIAL : The Toulon Tournament 2017 match schedule". 20 March 2017. ^ "England won their second Maurice Revello Tournament in a row against Ivory Coast!". 10 June 2017. ^ "Toulon Tournament: England 1-1 Ivory Coast (5-3 penalties)". BBC Sport. 10 June 2017. ^ "Toulon Tournament 2017 : the official line-up". 12 April 2017. ^ "The Toulon Tournament 2017 group stage draw". 15 April 2017. ^ "OFFICIAL : the Toulon Tournament 2017 fixtures". 28 April 2017. ^ "45th Tournament - Scorer". ^ "The Toulon Tournament 2017 awards". Toulon Tournament. 11 June 2017. ^ "Toulon Tournament 2017 best XI". 12 June 2017. This page was last edited on 24 January 2019, at 14:02 (UTC).